Looking for a sweet holiday treat to give that won't take all day? 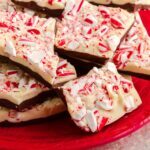 This homemade peppermint bark is easy to make and the perfect holiday gift! Start by unwrapping a pile of candy canes, then place them in a large ziplock bag. Put that ziplock bag within a second ziplock bag (broken candy canes are sharp), then break the candy canes into small pieces. I used a rolling pin to smash them. Cover 3 cookie sheets (for a large batch) with non-stick foil or wax paper. Boil water in a double boiler. Since I don't have a double boiler, I used a bowl over a saucepan, which worked just as well. Fill the water to just below the bowl, but not touching the bowl. Slowly melt the chocolate chips, stirring frequently. I discovered it works better to mostly melt one bag before adding the next bag, rather than dumping them in all at once. Spread out the chocolate on the foil covered cookie sheets. It should be fairly thin, approximately 1/8" thick. Place cookie sheets in the fridge to harden for about a half-hour. While the chocolate layer is cooling, rinse your bowl or double boiler pan and repeat the melting process with the white chocolate chips. If desired, add 1/4 tsp Peppermint Vitality Essential Oil or 1 tsp peppermint extract to the melted white chocolate for extra pepper-minty flavor. Spread out the melted white chocolate in a layer over top of the brown chocolate. While it is still wet, quickly sprinkle on the broken candy cane pieces. Place in the refrigerator to harden completely, about an hour. Once the bark has hardened, break into pieces by hand, then place into cellophane bags. To seal the bags, cut pieces of holiday scrapbook paper into 4x4" squares, then fold the squares in half. Fold over the tops of the cellophane bags a couple of times, then staple the scrapbook paper over the fold. If desired, print labels to glue onto the scrapbook paper.